The Kelpies are 30-metre-high horse-head sculptures depicting kelpies (shape-shifting water spirits), standing next to a new extension to the Forth and Clyde Canal, and near River Carron, in The Helix, a new parkland project built to connect 16 communities in the Falkirk Council Area, Scotland. The sculptures were designed by sculptor Andy Scott and were completed in October 2013. The sculptures form a gateway at the eastern entrance to the Forth and Clyde canal, and the new canal extension built as part of The Helix land transformation project. The Kelpies are a monument to horse powered heritage across Scotland. The sculptures were opened to the public in October 2013 . As part of the project, they will have their own visitor centre, and sit beside a newly developed canal turning pool and extension. This canal extension reconnects the Forth and Clyde Canal with the River Forth, and improves navigation between the East and West of Scotland. The name was chosen by Scottish Canals at the inception of The Helix project, in 2005. The Kelpies name reflected the mythological transforming beasts possessing the strength and endurance of 10 horses; a quality that is analogous with the transformational change and endurance of Scotland's inland waterways. The Kelpies represent the lineage of the heavy horse of Scottish industry and economy, pulling the wagons, ploughs, barges and coalships that shaped the geographical layout of the Falkirk area. According to sculptor Andy Scott, "The original concept of mythical water horses was a valid starting point for the artistic development of the structures." He also said that he “took that concept and moved with it towards a more equine and contemporary response, shifting from any mythological references towards a socio-historical monument intended to celebrate the horse’s role in industry and agriculture as well as the obvious association with the canals as tow horses”. In 2008 Scott created three-metre-high miniature versions in his Glasgow studio. These were then scanned by lasers to help the steel fabricators create accurate full-scale components. 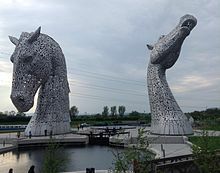 According to Scott the end result would be "Water-borne, towering gateways into The Helix, the Forth and Clyde Canal and Scotland, translating the legacy of the area into proud equine guardians". During the first year following the opening, nearly one million people visited the sculptures. The first routine maintenance and cleaning was carried out by a high-wire team in the summer of 2017. Built of structural steel with a stainless steel cladding, The Kelpies are 30 metres high and weigh 300 tonnes each. Construction began in June 2013, and was complete by October 2013. However the process of fabricating the steel was several years in the making. SH Structures, of Yorkshire, carried out this fabrication and also managed the erection of the sculptures on site. The Kelpies are positioned either side of a specially constructed lock and basin, part of the redeveloped Kelpies Hub. There are two sets of 1:10 scale maquettes. These have been displayed locally, nationally, and internationally at events and locations including Edinburgh Airport, the Field Museum in Grant Park, Chicago, The Falkirk Wheel, Expo 2011 (Aberdeen), Expo 2012 (Edinburgh) and Expo 2013 (Glasgow), BBC Scotland, Glasgow, Kirkcudbright Arts & Crafts Trail 2017, University of Glasgow, Sheffield International Steel Celebration and more recently Bryant Park in New York. Sculpted from steel then galvanized using a hot dip process, the Kelpie maquettes were welded by hand from small plates of steel. The judges of the Structural Steel Design Awards 2014 said the structures required "considerable engineering finesse". The Guardian reported that "They will create one of the most dramatic gateways through which to enter Britain". The New Civil Engineer website defined the Kelpies as "one of Scotland’s most complex sculptures"
The Ordnance Survey described them as "amazing and dramatic". Tiffany Jenkins on The Scotsman wrote that "They are impressive, stunning even, and I think people will become attached to them and proud of them. Of course, they will not please everyone, but that it is not possible as no such art work exists". Jonathan Jones, writing in The Guardian, described them as "the latest misbegotten "masterpiece" of public art. It is big. It is bold. And it is rotten. [...] The Kelpies is just a kitsch exercise in art "for the people", carefully stripped of difficulty, controversy and meaning." ^ "Kelpies giant horse head sculptures near completion in Scotland". wusa9.com. 9 October 2013. Retrieved 14 October 2013. ^ "The Kelpies sculptures beside M9 near completion". The Scotsman. 25 September 2013. Retrieved 14 October 2013. ^ "The Kelpies - Public Art by Andy Scott at The Helix, Falkirk". Thehelix.co.uk. 20 August 2013. Retrieved 14 October 2013. ^ a b Sleigh, William (21 April 2015). "The Kelpies". WL Sleigh. Retrieved 3 August 2015. ^ Carrell, Severin (24 November 2008). "Meet the Kelpies, Scotland's giant addition to the UK sculptural skyline". The Guardian. Retrieved 14 October 2013. ^ "From Andy Scott's vision to a stunning reality". TheHelix.co.uk. Retrieved 3 August 2015. ^ "Falkirk's year-old Kelpies set for millionth visitor". BBC News. Retrieved 11 November 2015. ^ "High-wire team give Kelpies their first health check". BBC News. 29 May 2017. Retrieved 29 May 2017. ^ "Projects". Shstructures.com. Retrieved 14 October 2013. ^ "BBC News - Kelpies sculpture assembled between Falkirk and Grangemouth". Bbc.co.uk. 29 June 2013. Retrieved 14 October 2013. ^ "Award – The Kelpies, Falkirk". New Steel Construcation. 15 July 2014. Retrieved 3 August 2015. ^ Mackay, Mark (17 September 2013). "Perth given a sneak preview of Kelpies statues". Perth & Kinross Courier. ^ Carrell, Severin (24 November 2008). "Meet the Kelpies, Scotland's giant addition to the UK sculptural skyline". The Guardian. ^ "Kelpies horses sculpture: Equine Equation". New Civil Engineer. 30 August 2011. ^ "A dramatic change updated – Kelpies!". Ordnance Survey. 16 January 2014. ^ Jenkins, Tiffany (2 December 2013). "Tiffany Jenkins: Kelpies will encourage public art". The Scotsman. Retrieved 3 August 2015. ^ Jones, Jonathan. "The Kelpies: why Scotland's new public art is just a pile of horse poo". the Guardian. Retrieved 11 November 2015. Wikimedia Commons has media related to The Kelpies. This page was last edited on 16 February 2019, at 18:17 (UTC).